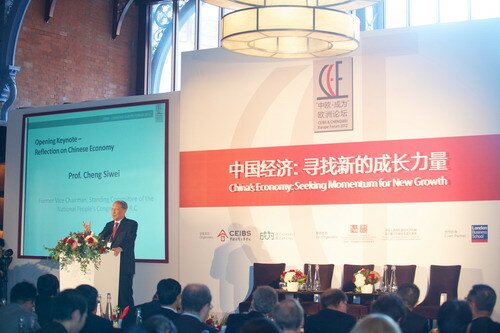 On November 6, the “CHENGWEI Europe Forum 2012” was held at St. Pancras Renaissance London Hotel. Cheng Siwei, Vice Chairman of the Standing Committee of the Tenth National People’s Congress, Zhong Shan, Vice Minister of Commerce, Cong Peiwu, Charge D’affaires of the Chinese Embassy, Zhu Xiaoming, President of China Europe International Business School, Sir Andrew Likierman, Dean of London Business School (CEIBS), and over 300 guests from the Chinese and British political, business and academic communities attended the Forum. The Forum was jointly hosted by CEIBS, CHENGWEI CAPITAL, Organizing Committee of the Exhibition Contemporary Chinese Seals by Li Langqing, the Chinese Embassy in the UK and London Business School. It was aimed at exploring the momentum for new growth in China’s economy and carrying out East-West dialogue and exchanges in the context of globalization. Mr. Cheng Siwei delivered a keynote speech entitled “Reflection on Chinese Economy”. He pointed out that economic competition also means the competition in science and technology, which takes the competition in human resources as its core, and the competition in human resources focuses on the competition in creativity. To achieve new economic growth, China must increase the internal momentum, change the pattern of investment-led growth and boost domestic consumption, transform the extensive development into intensive development and rely more on internal forces rather than external ones. Vice Minister Zhong Shan made opening remarks. He said that this Forum is an economic summit in the series of events of “Contemporary Chinese Seals by Li Langqing”. He hoped that the series activities such as exhibitions and academic seminars in the UK would promote the China-EU exchanges in culture, education, economy, trade and other fields. Charge D’affaires Cong Peiwu read out Ambassador Liu Xiaoming’s message of congratulations. Ambassador Liu pointed out in the message that Europe is a fitting venue for this Forum. He said that Europe is China’s largest trading partner and the main technology source, China is also Europe’s most important trading partner. Without recovery and growth of European economy, growth of China would be impossible. To achieve economic growth, China needs to explore European markets. He believed that CHENGWEI Europe Forum 2012 would make a positive contribution to deepening China-Europe economic cooperation. President Zhu Xiaoming said in his welcome speech that the world economy is in a difficult time, and that China, Europe and other countries need to join hands and enhance cooperation for achieving recovery. The participants conducted in-depth discussion on the prospects for China’s economic development, the trend of globalization and other topics.